In WWE, there's only one man whose attention you really need to get, and one man who you need to impress to make it to the top - Vince McMahon. However, given that WWE is on the road every week of the year and matches happen as often as they do, wrestlers are bound to make mistakes and have bad matches. One thing that fans should know is that there are no real days off for Vince McMahon. He's essentially backstage for every episode of RAW, SmackDown and PPVs. Being in gorilla position, he takes note of everything going on and is always in the ears of the commentators, rectifying them or telling them what to plug in when. He's known to be a micromanager of sorts, which is why you can imagine that he has very high expectations of his performers. However, not every match is going to live up to expectations, and no matter how much experience or skill a superstar has, a dud match is something that's bound to happen to anyone the longer they wrestle. It doesn't even have to be just a dud match that annoys McMahon. It can be an incident mid-match which he deemed inappropriate. 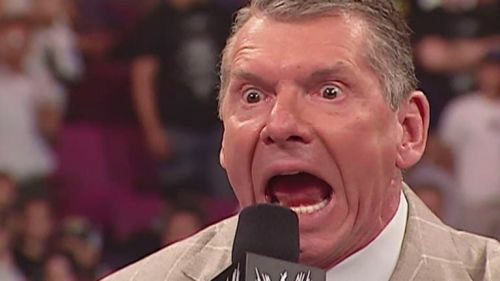 We look at 5 such instances where Vince McMahon got angry during a match. In their world title match on RAW in a steel cage, Batista decided that blading wouldn't be too bad an idea, deciding to do so without McMahon's knowledge. After the match, McMahon was infuriated with him and took him to his office to give him a earful. Batista was fined a 100,00$, while Chris Jericho, referee Mike Chioda and Dean Malenko (the match agent) were fined around $6,500 each. Batista ended up paying all of their fines, and while he may have understood being berated for his actions, he disagreed with the hefty price.